The Acoustic Club is a live music venue presenting local, independent and nationally touring performers. All aspiring songwriters, musicians and singers are invited to attend and play in front of a live audience. All types of music and singers are welcome. 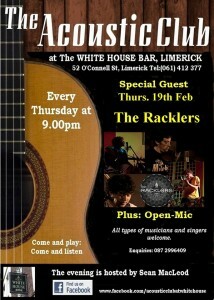 Munster based The Racklers are an acoustic act formed in Cork in 2013 drawing influence from island records staples like John Marytn and Nick Drake and covering everything from soft acoustic picking to Blues and Jazz and everything in between.